Here is a dowsers colour chart that is available for dowsers to download and print, they have been made available at Waverley Dowsers training sessions and will be available at future training sessions where complete tuition will be provided to those who attend. 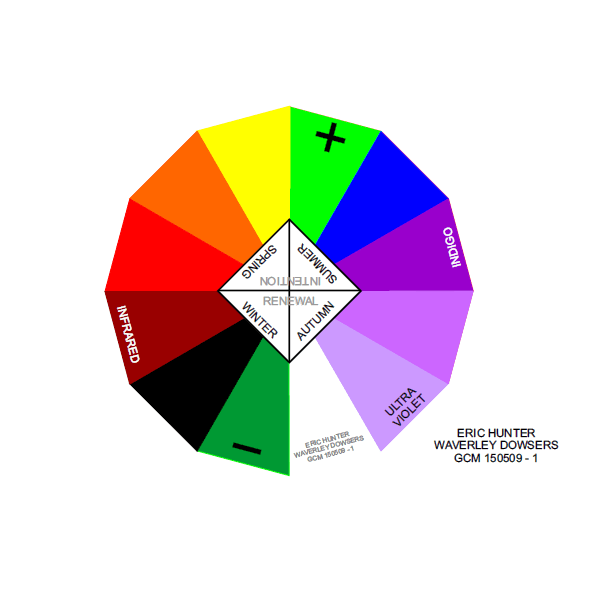 To use the dowsers colour wheel, you can hold the colour wheel between finger and thumb of one hand while using your pendulum or dowsing rod in your primary hand and ask, ‘is this energy I am dowsing the colour I am holding between finger and thumb’ (or a varation of this question)and recieve the yes or no answer through your dowsing device. This should allow you to build up a knowledge of colours related to the sites that you dowse. You can create a chart for yourself of what each colour means for you. (as different dowsers can experience different colours for the same energy) But you should find that certain materials will emit the same colour for everyone, metals are a case in point. Some energys that you dowse are likely to display a different colour due to energy input by the moon, you can study the tidal highs and lows of the sea to understand this relationship as a hedgewitch would do. You will also find that the time of year or season will effect the colour of the energy/object that you are dowsing, especially plants if used for healing. So the colour mager will help you with all of this identification of energys and plants and what is suitable for your needs. For further guidance charts please visit our articles page where you will find additional help and guidance for troubleshooting your dowsing and further help in energy dowsing. to visit the articles page and read our many dowsing article see the menu at the top of this website page.